DURHAM, N.C. – The North Carolina Central University baseball program saw two more awards earned by student-athletes as freshmen Corey Joyce (Lexington, N.C.) and Carter Williams (Brown Summit, N.C.) were named to the North Carolina Collegiate Sports Information Association Baseball University Division All-State Second Team. 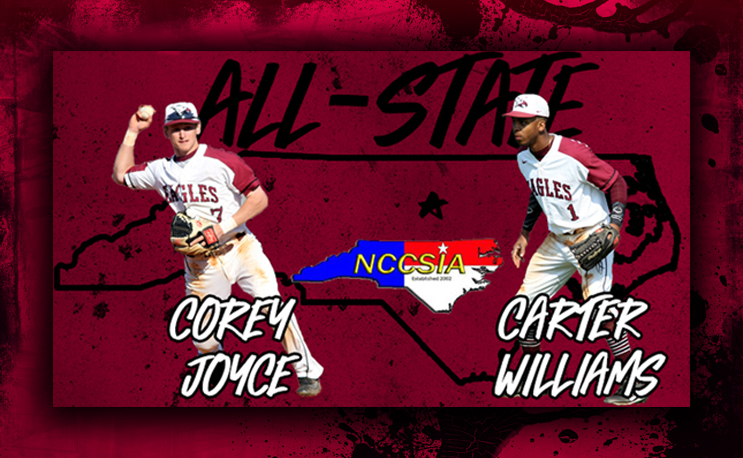 Joyce and Williams join current Eagle Carlos Ortiz (Cleveland, Ohio) and former student-athletes Alex Dandridge, Zack Lee, Tyson Simpson, Andrew Vernon and Carter Williamson on the list of NCCU student-athletes who have been named NCCSIA Baseball All-State. Joyce became just the second Eagle to be named Mid-Eastern Athletic Conference Rookie of the Year after Ortiz earned the honor in 2014, and was recently named a Collegiate Baseball Freshman All-American. Joyce was also a First Team All-MEAC selection, Black College Nines Large School First Team member, and a two-time MEAC Rookie of the Week honoree. He hit .344 this season and drove in a team-high 43 RBI with 11 doubles, a team-high three triples, and tied for the team lead with five home runs. Joyce was also in the top-10 of the MEAC in batting average, and top-five in in RBI, home runs and hits with 65. He had the team’s highest slugging percentage at .513 with 97 total bases and an on base percentage of .417. Williams was also named a Collegiate Baseball Freshman All-American and he was a Second Team All-MEAC selection after he broke the NCCU modern era single-season hit record with 72 hits, which is the most in the league. He was also a two-time MEAC weekly award recipient as he was named both Rookie and Player of the Week during the campaign. Williams was also top-10 in batting average at .351 and in on base percentage with a mark of .427. He knocked 14 doubles in his rookie campaign and touched home 42 times from the leadoff spot. He also swatted a pair of home runs along with 14 doubles and a triple, and generated 26 RBI.